Are you suffering from hair thinning? We have a solution. 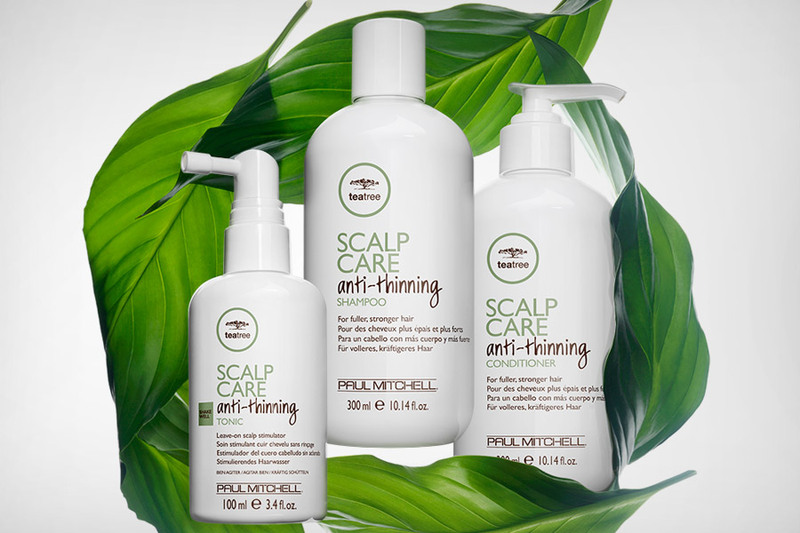 Introducing the new Paul Mitchell Tea Tree Scalp Care system, which effectively slows down the process of hair thinning. What is the Paul Mitchell Tea Tree Scalp Care system? The Tea Tree Scalp Care system with Regeniplex botanical blend is a preventative system that gently and naturally helps slow down the process of hair thinning. The range promotes optimal scalp health and ensures healthy, thicker hair. In clinical tests 85% of users reported an increase in hair volume and strength. What causes hair thinning or hair loss? There are several causes including ageing, genetics, hormonal changes and environmental damage. This system is ideal for both men and women. Is this system safe to use on coloured hair? Yes the products are gentle enough to be used on coloured hair. What is the Regeniplex botanical blend? The naturally inspired botanical blend of five active ingredients, stimulate the scalp and encourage healthy hair growth. Step one: Stimulate tired scalps with the Anti-Thinning Shampoo. This colour-safe cleanser removes impurities priming the scalp for stronger, thicker-looking hair. Step two: Strengthen fragile scalps with the Lightweight Scalp Care Anti-Thinning Conditioner which protects against breakage, resulting in fuller hair. Step three: Regenerate by using the Scalp Care Anti-Thinning Tonic. This effective spray extends the growth and resting stage, shortening the cycle of hair fall. Apply twice daily to increase hair density and encourage healthy hair growth.